The March for Our Health came out of many people’s experiences with the current profit-based healthcare system. In California, the Democratic Party shelved California Senate Bill 562, the bill that would establish health care as a right to all California residents, on behalf of health insurance and pharmaceutical companies. This occurred despite the Democrats’ base supporting Medicare for All and their state party platform actually including support of a statewide single-payer plan. We decided that we needed to take our fight to the streets to confront Kaiser Permanente, the largest healthcare corporation publicly opposing SB 562. Oakland-based Kaiser is both California’s largest private employer with over 160,000 workers in the state and its largest health insurer, covering 8.8 million Californians, 22% of the population. Afi Kambon, the Secretary of Berkeley NAACP and a speaker at the March for Our Health, was outraged that Kaiser compared selling insurance to amputation. Afi was born at Kaiser’s Oakland hospital in a racially segregated maternity ward. At age 11, she lost her left leg to bone cancer. At age 18, Kaiser cut her off from their health plan because they considered her a financial “liability.” Afi, like the other speakers, believes we need free health care for all now and that the rich must be taxed to pay for it. Under capitalism, health and health care is viewed as a commodity, a product that can be bought and sold. Insurance is a commodity, so are drugs, surgeries, hospitals, and our bodies. Corporate threats like Kaiser’s are the norm in this unhealthy system. Large private entities will say and do whatever it takes to maintain their profits. That’s why we need to stand up, speak out and take the fight to the big healthcare corporations. Socialist Alternative Bay Area initiated this march because we believe it will require a mass movement to win Medicare for All. Legislative efforts on their own are not enough. Historically, any significant victories people have won in the U.S. have been won by mass movements, from women’s suffrage to civil rights. Organizing a fight for Medicare for All will develop the skills and relationships of a whole new section of activists. 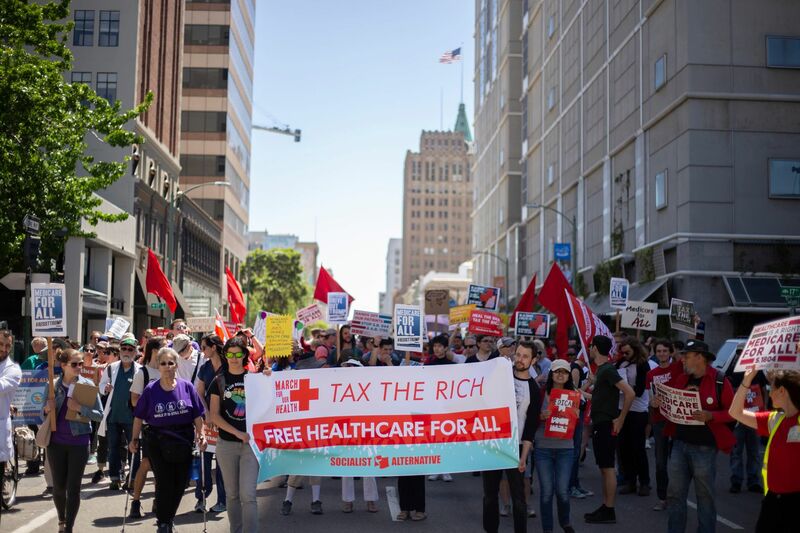 Members from Socialist Alternative, Democratic Socialists of America, Health Care for All – California, Physicians for a National Health Program, California Nurses Association, Our Revolution, and many others worked together to organize the March for Our Health. Moving forward, we will need to continue to build a broad united front rooted in the working class to win Medicare for All. Winning Medicare for All paid for by taxing the rich would be a decisive victory for working-class people against one of the most brutal capitalist institutions, the profit-based healthcare system. The quality of our health care would no longer be tied to our job or income and winning this would raise our self-confidence, willingness to fight, and our understanding of what is possible. At the public speak out at Kaiser that ended the March for Our Health, one after another working person got up to talk about their own healthcare crisis story. Large numbers were millennials, under-insured and up to their necks in debt and rent payments. Some stories had people tearing up, others were interrupted by cheering. This generation is not willing to accept the precarious life that capitalism is shaping for them. Ultimately, we need to fight for fully public health care, which would remove profiteering from the entire system, from financing to care providers to medication. Capitalism prioritizes profits over people. We need to create a system that is not about making money, but about making people well. Bringing together our wide coalition to point the finger at corporate health care marked another step forward for our movement. Release and pass SB 562 as a pathway to nationwide Medicare for all! Get private profits out of Our Health care! Free, quality public Health care for all! Previous articleLabor Upsurge: University of Washington Grad Student Workers Strike!